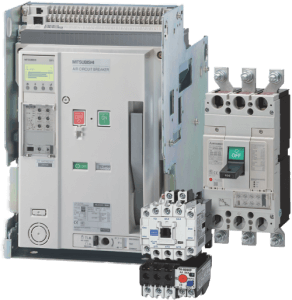 Mitsubishi Electric’s low voltage switchgears meet all the standards and specification laid down in the EU Low voltage Directive 73/23/EEC and the Machinery Directive 98/37/EC. All the units carry he CE mark and are certified as conforming to UL, cUL and GOST. The advanced technology of the WS-V series is based on a proven Mitsubishi Electric patent, and in consideration of the layout of the current leads provides excellent opening cycles of the main conductors. The new circuit breaking technology “Expanded ISTAC” upgrades current limiting performance for a higher breaking capacity. With higher breaking capacity, lower class models can be used, thus leading to cost reduction of switch panels and machines. Extending the conductor (reaction circuit for movable conductor) beneath the fixed conductor makes the movable conductor open faster than the conventional ISTAC mechanism. This significantly improves the current limiting performance and reduces the maximum peak current by 10 %. Mitsubishi Electric Cooperation Fukuyama Works uses energy saving support devices such as MDU breakers and EcoServer to save energy through “visualization” of energy. Along with “visualization”, Fukuyama Works also installed high-efficiency equipments to further promote energy saving. Through energy saving activity, Fukuyama Works has successfully reduced its electrical power consumption rate by 27 % in 2007 (compared with 1990).